The Virtual Book Club for Kids is reading Amy Rosenthal this month. For our activity, we decided to focus on Duck! Rabbit! , Rosenthal’s imaginative take on cloud-watching. There is an image, and the book is an ongoing debate about whether it is a duck or a rabbit. The boys had fun playing with puppets I made for the book. One duck, and one rabbit. Making the puppets: I traced the image on the front cover. Then I cut out two images out of white paper. I outlined the puppet in black marker, and glued both sides onto popsicle sticks. I made 2 sets of these – one with an orange duck bill and the other with pink inside the rabbit ears. Puppet Play: We read the story together, using the puppets. 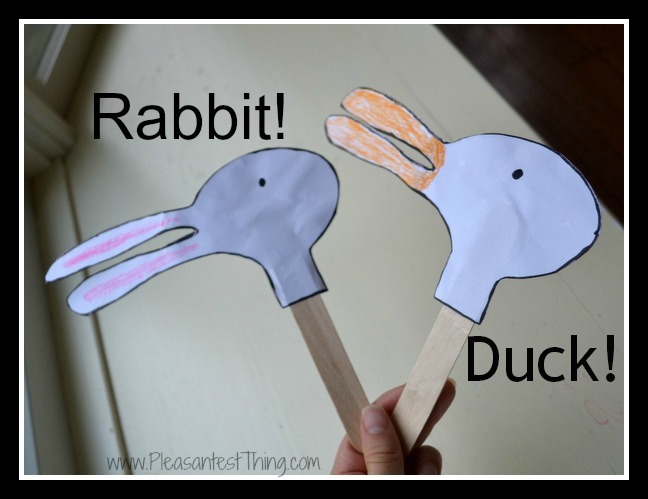 Then we played with the puppets: we hopped the rabbit, and waddled the duck. The animals chased each other, we fed them, we pretended to walk the rabbit to a rabbit den and the duck to its nest. Does it have feathers or fur? 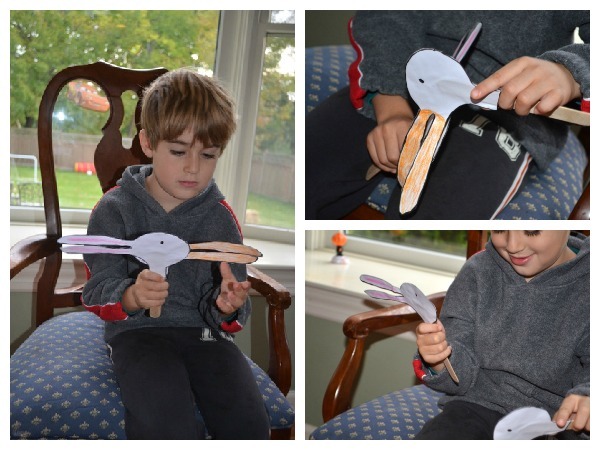 My 4 1/2 year old also enjoyed putting the puppets together- so it was both a duck AND a rabbit! Have you used puppets to retell a story yet? Which ones are your favorites? Looking for ideas for the 2 and under crowd? Check out Zero to Two: the book of play, an e-book I co-authored! It includes 25 step-by-step tutorials with pictures, as well as links to over 50 more ways to play with babies and toddlers – all for $8.99. Disclosure: Amazon affiliate links are used in this post.